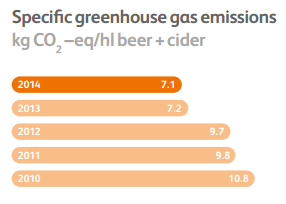 Brewing giant Heineken UK has released its 2014 Sustainability Report, revealing small reductions in emissions from production and distribution, but no change in water efficiency. Writing in the report introduction, managing director David Forde said: "Heineken was 150 years old in 2014. If we're to be successful for the next 150 years we must become a more sustainable company"
The 2014 document reports on the progress of the firm’s ‘Brewing a Better World’ strategy, which includes protecting water sources, reducing emissions and sourcing sustainably. Writing in the report introduction, managing director David Forde said: “Heineken was 150 years old in 2014. If we’re to be successful for the next 150 years we must become a more sustainable company”. 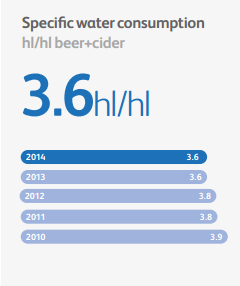 In 2014, water consumption remained flat versus 2013 at 3.6 hectolitres of water per hectolitre of product. However, Heineken describe this outcome as a ‘significant achievement’, because overall production fell by 9%. Water-saving initiatives in the last year included new cleaning cycles which halved water usage in some plants, and a new reverse osmosis cleaning plant at a ciderie in Hereford, also cutting wastewater. Heineken UK safety & environment manager Shane Gardner said: “For a business like ours, water is central to our needs - beer, after all, is 95% water. Distribution emissions fell 4.5% vs 2013, thanks to the creation of a new National Distribution Centre in Derby, which is more optimally situated for deliveries. Heineken said the new centre takes 850 vehicle journeys off the road a year, saving 300 tonnes of CO2. Heineken also embraced a new ‘one touch delivery system’, where deliveries go straight from production sites to the customer, skipping out the distribution site. During 2014, the firm made over 5,900 direct customer deliveries, saving 700 tons of CO2. Heineken’s production emissions also fell, albeit by 1% compared with 2013. The crown jewel in this area is the Tadcaster brewery, with its 4,000 solar panels and on-site anaerobic digester. Up to 15% of the brewery’s energy comes from these renewable resources, and management has reportedly started putting together a plan for a 500kw wind turbine on the site. Finally, Heineken reported progress on its targets for sustainable sourcing for crop year 2015: 20% of barley, 40% of hops and 60% of apples. Up to 30% of Britain's apples go into Heineken's ciders. Heineken growers development manager Chris Muntz said: “Our sustainable sourcing goals for barley and cider apples are demanding and in order to make progress it’s essential we collaborate with our farmers.